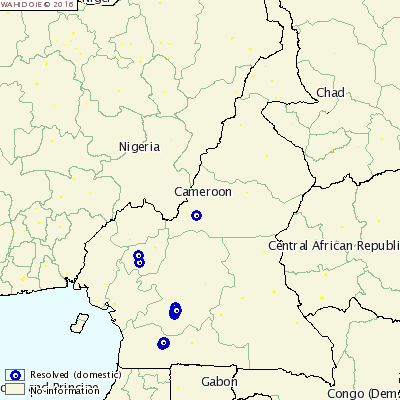 CAMEROON - Sixteen new outbreaks of highly pathogenic avian influenza have been reported in Cameroon, dating back to May and June. The latest report from the country to the World Organisation for Animal Health (OIE) detailed the outbreaks and twelve farms and various backyard premises, on the western side of the country. Over 7000 birds died in the outbreaks, and another 26,981 were destroyed to prevent the disease spreading further. The outbreaks were of the H5N1 strain and affected all types of poultry. The outbreaks were detected through epidemiological surveillance following the first outbreak earlier this year. Other control measures include zoning and movement controls.